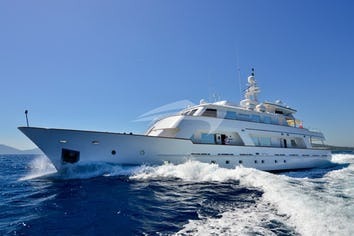 AVA can accommodate 10 guests in 5 cabins. The Master cabin has a king size bed, bath/tub, shower and toilet. 2 Guest cabins have 2 single beds, bath/tub, shower and toilet. A Guest cabin has a queen size bed, bath/tub, shower and toilet. A Guest cabin has 2 single beds, shower and toilet. AVA is fully air conditioned through out. Crew has a separate companionway, heads and shower. Jeff has been aboard AVA for 8 years. 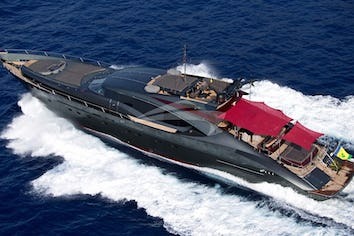 He holds an Ocean Operator's license from the USCG, a Yachtmaster Offshore License, Endorsed Commercila, Class 4 British MCA 3,000 ton commercial License. He speaks English, French, Spanish and Italian. He arrives in the Mediterranean 23 years ago making his home base Monaco. 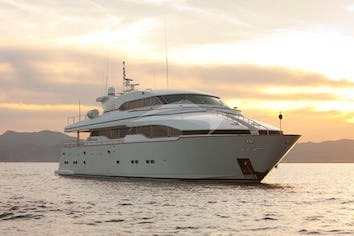 He has been a Charter captain ever sine then and has cruised extensively the French Riviera, Corsica, Sardinia, the Italian Coast and Islands, Spanish mainland and Baleric Island and Greece. He is an avid water skier, jet skier, diver, swimmer and fisherman. His family in the states was in the restaurant business which allows him to also value good food and service onboard. He has been lucky being able to make aliving with his love of boats and the sea. Chef BERNARD VALLET, French, age 45, has been onboard AVA for 7 years. He has been Head Chef, Second Chef, Chef of Parti, Commies de CUisine and Apprentice Chef. He speaks English, French, Spanish, Italian and Portugese. He grew up in Lyon France ahd has worked in restaurants his whole life. For the last 10 years he has beenworking as a chef on Yachts in Europe and the States. He is a very easy perton to get along with and he is eager to satisfy and pelase the guests onboard. He is always in a good mood, finds the best fresh foods in each cruising area and can prepare gastronomic, light, vegetarian, children's vareity requirements.